After completing Secondary School in 2003, Mr. James Ross earned an undergraduate degree in Economics at through Laurentian University in 2006. James then attended Law School, where he studied and trained at the University of Western Ontario graduating in 2009. James articled with a full service law firm here in Greater Sudbury. He has experience representing client cases in various legal areas including civil litigation, personal injury, criminal law, corporate and real estate law as well as estate planning. He remained at that firm until he was called to the bar in 2010 and there after spent 3 years working with Conroy Trebb Scott Hurtubise LLP in Greater Sudbury Ontario honing his skills and experience. James joined Tomm Orendorff, Michael Gauthier and John Micheal Bray and the team at Orendorff & Associates, Sudbury's Personal Injury Lawyers in summer of 2013. The opportunity to help defend injury victims and their families was an attractive option, one that James values and looks forward to helping serve. 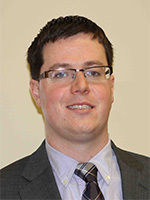 James is the treasurer of the Sudbury District Law Association, he is a member of the Advocates Society and the Ontario Trial Lawyers Association and he is actively involved in the planning and coordinating of the Northeast Region Colloquium. James serves to motivate youth about the law profession by volunteering in High School Mock Trials and exposing youth to the Law and Justice System. James is an important member of the Orendorff & Associates team, Sudbury's Personal Injury Lawyers. Fighting for your rights and the rights of your family.